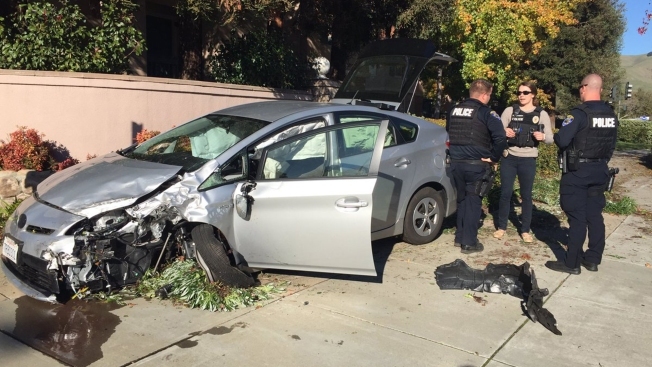 A man in his 50s was hospitalized with major injuries Thursday after a burglary suspect attempting to evade a Fremont police officer crashed into him, police said. Someone who lives off Rancho Parkway returned home and stumbled across a burglar, who fled the house and jumped into a car. The victim took a photograph of the suspect vehicle and called 911 around 1 p.m., police said. An officer saw a car matching the description provided, and tried to pull the driver over near Mission and Stevenson boulevards. The 21-year-old suspect, however, sped off. The pursuit spanned more than a mile, police said, and the suspect often reached 70 mph. It ended when the suspect crashed into a gray sedan at Guardina Drive and Walnut Avenue. The man inside that car was severely injured, but conscious when he was rushed to a hospital, police said. Meanwhile, the burglary suspect jumped out of his car and ran into an apartment complex where he was nabbed. Police found that he was driving a stolen car that contained items reported missing after a residential burglary on Wednesday. "What’s interesting is that is [the vehicle] was stolen yesterday during a residential burglary that occurred in town," said Geneva Bosques with the Fremont Police Department. "Property lost during that burglary was found in the vehicle." The suspect was taken to a hospital for evaluation, but there is no word on the extent of his injuries. "He is facing charges of residential burglary, evading, probably multiple charges from the collision," Bosques said.